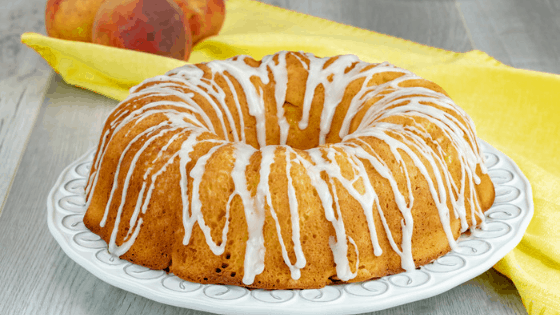 A flavorful and easy to make peach sour cream pound cake made in a 10 cup bundt pan and drizzled with a vanilla glaze. This recipe is really simple to make. This recipe is made using canned peaches but you can use fresh peaches if you would like. The sour cream added to this pound cake makes it a little lighter and as well as softer. Sour cream is a great addition when trying to achieve a moist cake! It’s important to sift the flour before adding it in because not sifting can create a denser cake. This cake is simple to make because of the easy steps in making it as well as how quick it is! It does bake in the oven for about 35-40 minutes because most of the time for this cake is hands off. If you’ve never used a bundt pan before, you should know, they can be finicky. It’s important to grease the inside of the pan well before adding the batter in. Even if it says it’s a non-stick pan, grease it! To remove the cake from the pan, allow the cake to cool for 10 minutes after removing it from the oven. Once it has cooled for the 10 minutes, use a butter knife if needed to loosen sides of the cake (you shouldn’t need to if you greased it well), place the serving plate upside down on the pan, and use the handles of the bundt pan (and the plate) to flip the cake upside right. At this point, the cake should slide right out of the bundt pan. Although it may be tempting to “rush” this pound cake to be done – it’s important to practice patience! By not allowing the cake to cool completely and pouring the vanilla glaze onto the cake, it causes the glaze to melt into the cake! You will end up without the beautiful finish on the cake! When making this glaze, allow it to sit for a few minutes to allow it to thicken back up. This makes for a thicker drizzle that doesn’t run off of the cake. It’s also important to allow the glaze to harden onto the cake after it has been poured before touching or slicing it. Grease a 10 cup bundt cake pan well and set aside. In a large bowl, beat together the butter and sugar until it is well combined. Add in one egg at a time, then add in the vanilla. Combine together the flour, salt, and baking powder in a separate bowl. Dice and add the peaches into the flour mixture and stir. Slowly add the flour mixture into the wet ingredients. Spread evenly into the bundt pan and bake for about 35-40 minutes. Use a toothpick to check to see if the cake is done. Remove from oven and cool for 10 minutes before placing a plate on top of the bundt pan and flipping cake over to remove it from the mold. In a small bowl, mix together the confectioner's sugar and vanilla extract. Add in 1 tbsp of milk and mix well. It should be thick and not too runny. Add more milk if needed. Use a small ladle to drizzle the glaze onto the COMPLETELY COOL cake. I love pound cake but this one sounds super tasty. Thanks for sharing.